Urban Outfitters dress, old from last year (this is the SAME dress in eyelet), and a similar style here from Abercrombie; Steve Madden sandals. I don’t know about where you live, but here in Southern Alabama it is HOT! 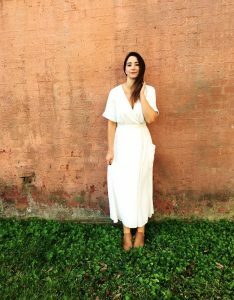 When it is this hot out in the majority of the country, the easiest thing to wear is a white dress. I bought this one last summer and have probably worn it about 50 times. Best. Purchase. Ever. It is made out of a lightweight linen type material, it floats around me and doesn’t cling when I am feeling extra sweaty (lol), and I get complimented on it each time I wear it. I also love the girly vibe it brings, I feel a little retro and a lot put together every time I throw it on. I love it most styled really simply. It is the type of dress that stands by itself, it doesn’t really need much to look good. Often I wear simple sandals or flip-flops, dainty hoop earings, and that’s it. Less is more when it is over 100 degrees and the thought of anything touching your body sounds awful. A couple more dresses I have been eyeing…. This wrap style white dress is definitely my next purchase. This square neck, button down midi dress has a similar look to mine above. I love it in black! This flutter sleeve midi dress looks like a dream to wear. And this daisy eyelet Free People mini dress is cute! I would probably layer it over denim cutoffs and wear a cute bralette under it. And speaking of feeling retro and ladylike, this yellow printed Gal Meets Glam dress and also her cap sleeved pink floral dress. I am thinking of investing in one of her dresses soon. Has anyone tried this brand out?